However, he later confirmed the reported sightings made by the public, police and airport staff from December 19 to 21 were being "actively investigated". "We are interviewing those who have reported these sightings, are carrying out extensive house-to-house inquiries, and carrying out a forensic examination of a damaged drone found near the perimeter of the airport." Det Ch Supt Tingley said it was "a working assumption" the device could be connected to their investigation, but officers were keeping "an open mind". Det Ch Supt Tingley said the arrested man and woman had "fully co-operated" with inquiries after information was received from a member of the public. He added: "We would not have chosen in any event to provide that information to anyone... and one might say that's probably hindered us in terms of how quickly we've been able to get to a resolution, in terms of them being released from custody." 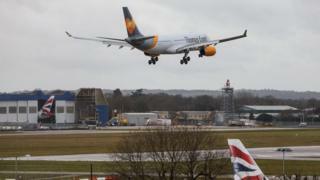 On Sunday the airport said it was operating as normal but there had been "some knock-on effect". Passengers have been urged to check with their airline for the latest information. John Murray, professor of robotics and autonomous systems at the University of Hull, said it could only "take the drone out of the sky".